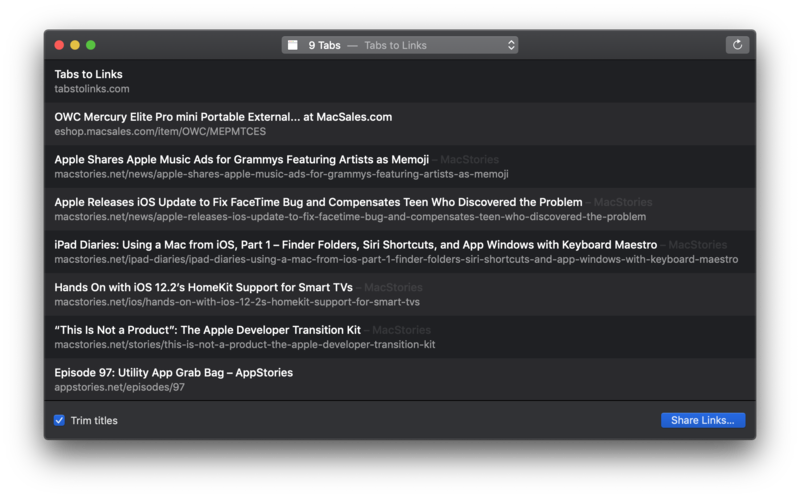 Yesterday Benjamin Mayo released Tabs to Links, a Mac utility that can grab the links and page titles from your open Safari tabs and send them to another app. The app is as simple as it sounds, but its thoughtful touches make it a tool I expect to use often. Tabs to Links features a one-window design with minimal chrome that’s dominated by a list of webpage titles and links. The contents of the app’s window can be automatically updated as you open and close tabs by selecting the ‘Automatically Refresh in Background’ option in the View menu. If the option is turned off though, you can still refresh the list by clicking the refresh button on the right side of the app’s toolbar. I expect I’ll leave automatic refreshing turned on most of the time, but the advantage of turning the feature off is that it allows you to create a snapshot of your current tabs without the concern that if you accidentally close a tab or window, you’ll affect your list of links. The center of the toolbar features a dropdown list of open Safari windows that shows the number of open tabs and the title of the active tab, making it easy to switch between lists of links for each open window. It’s worth noting that the list of links in the center of Tabs to Links’ window is limited to active links. Safari has a setting in its General preferences tab that allows you to restore windows and tabs from your last browsing session when you launch the app. It’s an option I use for those times when I accidentally quit Safari instead of closing a tab. The trouble is, when you restore a Safari window, the tabs are restored, but the webpages don’t load until you click on each of them. As a result, unless a restored tab has been opened after a restore, that tab won’t appear in Tabs to Links. To reduce Tabs to Links’ sparse window chrome even further, the app has an option in the View menu to hide the toolbar, which is worth considering if you’re working in a single window with automatic list refreshing turned on because, in that scenario, you don’t need access to the toolbar functionality. The app also supports Mojave’s dark mode, so it will look at home however you have your Mac set up. The bottom of the Tabs to Links window includes a couple of additional options. The first is a ‘Trim titles’ checkbox. If you have several tabs open to the same website, which appends the site’s name or other text to the end of the page title, ‘Trim titles’ will remove it. 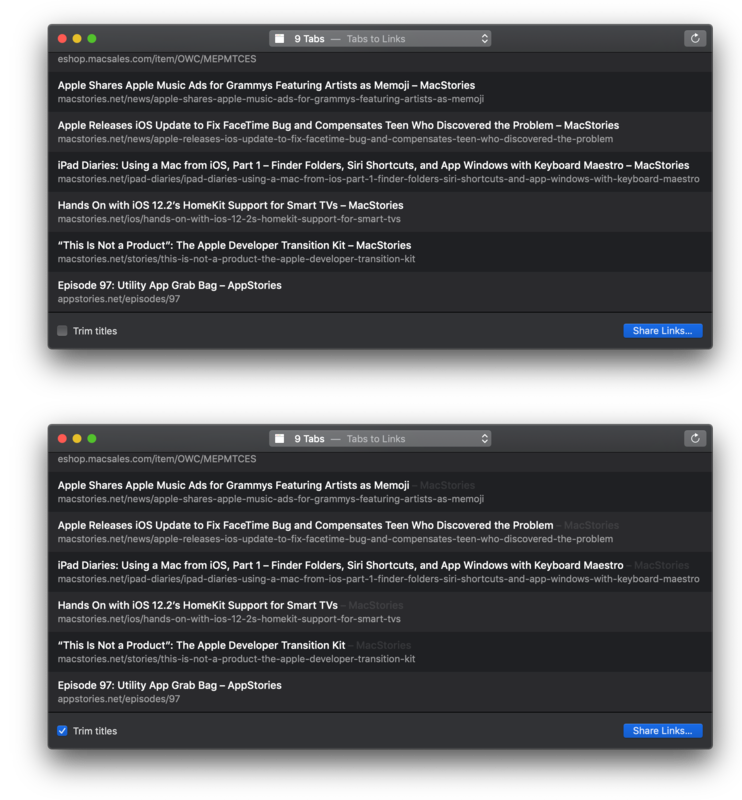 Below is an example of a list of several MacStories articles I opened in Safari. In Tabs to Links, the title of each article includes the name of the site at the end of the page’s title. With ‘Trim titles’ selected, ‘MacStories’ is grayed out and not included when the list of page titles is copied. Trim titles disabled (top) and enabled (bottom). Finally, there’s a ‘Share Links…’ button in the lower right-hand corner of the window, which allows the list of titles and links to be copied to the clipboard or to other apps on your Mac that have implemented a compatible share extension. By default, titles and links are copied as rich text. As a result, pasting to apps like Notes and Pages will generate a list of linked webpage titles, but pasting into a plain text editor only pastes the titles. If all you want are the URLs in the list, you can hold down the Option key which transforms the ‘Share Links…’ button into a ‘Share Links Without Titles…’ button. There are also keyboard shortcuts for Share Links (⌘+C) and Share Links Without Titles (⌥+⌘+C). One thing I’d like to see in a future update of Tabs to Links is better support for plain text editors in the form of an option to copy a Markdown-formatted version of titles and links. Also, I love the idea of working with a compact list of webpages instead of moving between tabs in Safari, and would like to see Tabs to Links’ list become more versatile. For example, I want to be able to preview a webpage from the app and drag an entry out of the list as a .webloc file for saving elsewhere. An open button to jump to a page in your list that may no longer be open in Safari would be a great addition too. Less than two weeks ago, Federico and I covered a few of our favorite utility apps on AppStories. I love handy little Mac and iOS utilities that make everyday tasks easier. Some of the very best are also the simplest, while paying close attention to small details that let users adapt their tools to the way they work. I spend a lot of time moving between tabs in Safari copying article titles and links for AppStories show notes and MacStories articles. While there are a few additional features I’d like to see added to Tabs to Links, especially Markdown support, it’s an app I expect to use a lot because, like many of my favorite utilities, it takes a repetitive task and makes it easier and faster to accomplish. Tabs to Links is available on the Mac App Store for $2.99.